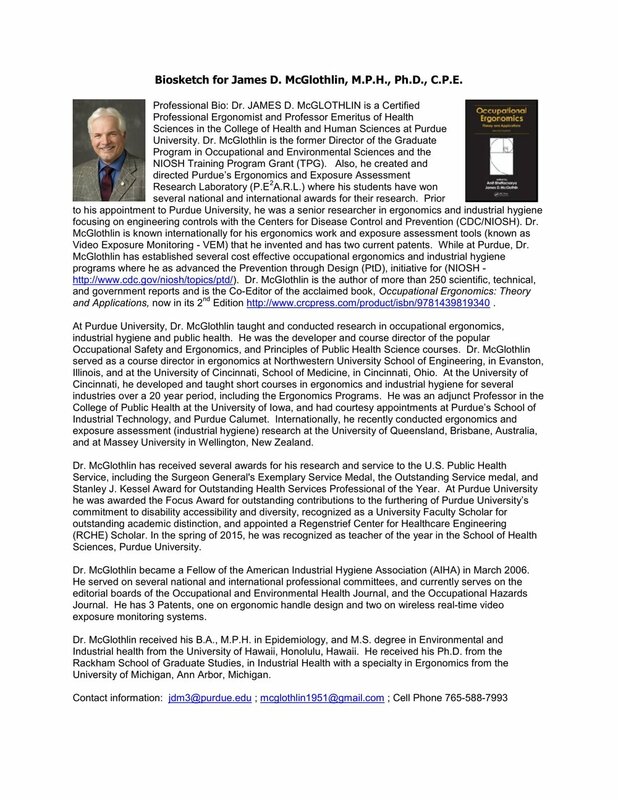 Dr. McGlothlin of McGlothlin Ergonomics in Grand Rapids, Michigan, is the author of more than 250 scientific, technical, and government reports. He is also the Co-Editor of the acclaimed book, Occupational Ergonomics: Theory and Applications, now in its 2nd Edition. Click here to view the publisher's site. Occupational Ergonomics: Theory and Applications is now in its second edition showing where significant advances have been made the field. These advances include understanding the impact of ageing and obesity on workplace, the role of ergonomics in promoting healthy workplaces and healthy life styles, the role of ergonomic science in the design of consumer products, and much more. The caliber of information and the simple, practical ergonomics solutions in the second edition of this groundbreaking ergonomics textbook, though, haven't changed.